As always, our DESIGNED collection provides you with ready-to-use, pre-designed sounds for instant awesomeness. You don’t have the time to build your own apocalyptic rampage? 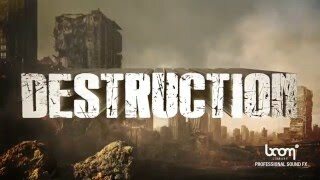 Our award-winning sound designers prepared this devastating pack of sounds for you, each of them a high-quality composition of destruction. Get ready for crashes and stress sounds of buildings, cars, glass, ice, metal, rock & wood – all of them in different sizes to perfectly fit your scene. DESTRUCTION DESIGNED contains 70+ files. Each file contains 4 versions to ensure flexibility and alternation. All of it recorded and produced in 96 kHz and 24-bit. The library also comes with super-detailed keywords and well-grounded Soundminer metadata. • Stressed and crashed metal, wood, glass, ice, rock, etc. You want to cause some epic havoc? Then the CONSTRUCTION KIT sound pack is your perfect companion for your very own and unique sound design. You get the whole gamut of destruction right at the tip of your fingers. These SFX come with more than 7 GB of high-quality source recordings delivered in 96 kHz, 24-bit, giving you only the best quality for heavy editing, pitching, and FX processing while keeping a top notch level of clarity and precision. To provide you with the fastest and easiest workflow possible, all files contain extensive metadata. Balance and mix the sounds just as you like and create your very own scenario of destruction.